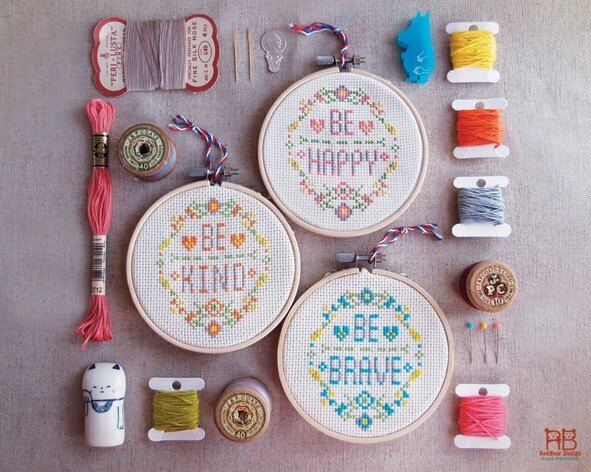 Modern quote Cross Stitch KIT DIY - Be Happy Be Brave Be Kind This modern and positive quotes cross stitch KITs are easy to make!! We always need to be positive thinking. Be Happy to life, Be Brave to act, Be kind to yourself/your love .... Sometime, it can be just easy like that... ---------------- Each Patterns Spec : - Fabric: 14 count - Finished stitched area (W x H) : 2-3/4" (7.3cm) x 3-1/2" (8.5cm) - Hoop size recommend : 4" ---------------- Cross Stitch KIT included : - Full Color Design chart and basic directions for beginners - Good quality cotton embroidery threads which enough to finish - 6 x Round point 24 tapestry needle - 3 x Cream cotton Aida fabric, 14 count - 3 x 4" Wooden Hoop A gift for your friends & family?? We do FREE gift wrap, just tell us ---------------- Please note : - KITs are despatched to worldwide by HONG KONG POST Tracked Airmail shipping (10 to 15 business days to arrive ). - Items are shipped as soon as possible after payment, usually within 1 to 3 business days. I will let you know after it despatched. - Post Fee including the packing material fee, time costs and postage costs.